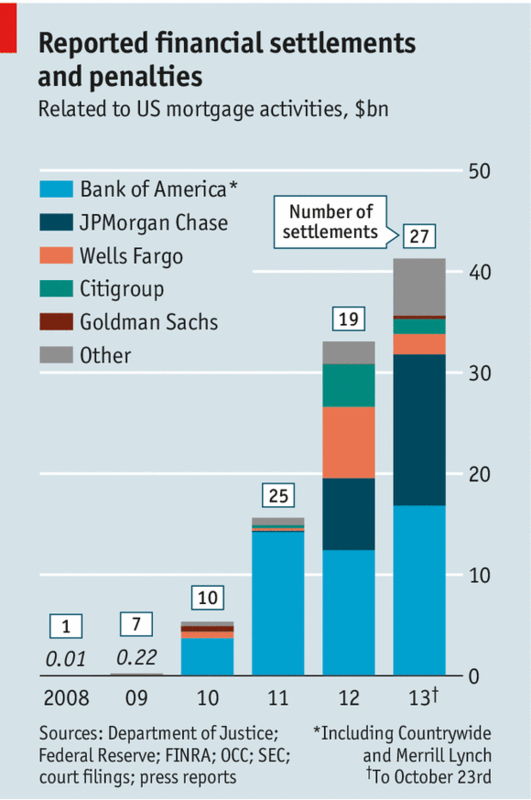 Settlement and fines for mortgage abuses are starting to add up to real money. Of course, as Matt Taibbi points out, this is still just a drop in the proverbial bucket compared to the related profits and scale of activities that took place. This chart looks like it should interesting but it’s quite confusing. What exactly does the Y axis display? The amount of fines? Some (undefined) ratio? Would be interesting to see the data in a better designed infographic. This will never make up for the damage these banks have caused for the U.S. economy as well as the contagion spread globally. It is too vast to even quantify. Our gov’t was complicit and the next bubble is already forming. The Fed and namls rule the world. Its the amount of payback in $bn, as per the label, isn’t it?